Great wall. 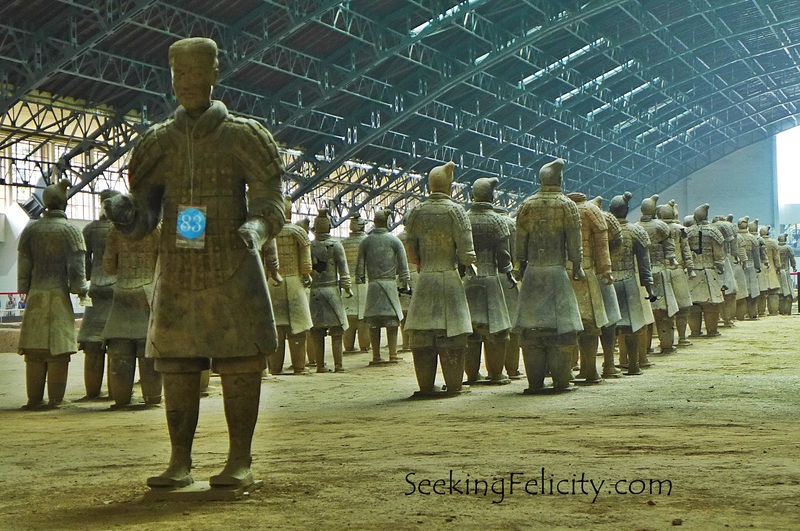 Terra cotta warriors. Dumplings. Maglev. Beijing. These (are just some of the many) things come to mind when I think of China. Michael and I flew to China last May 2015 and went around the country for a week before continuing the journey to Japan. Since I prefer not to be holed up in a chain-hotel, we’ve decided to stay in a traditional courtyard in a hutong. Hutongs are “alleys formed by lines of traditional courtyard residences joined together.” The fact that they are a destination in themselves was a big plus. It’d be quiet and serene within the courtyard but as soon as you step outside, you have numerous choices of shops, eateries and sights to choose from. We arrived late at night. No problem. My luggage was one of the last to appear in the carousel baggage that the public transport I had read and planned for was already closed. Plan B: take a cab- after figuring out where to get a cab and having them call our courtyard for directions. It was a warm and sunny day. We had a “tourist map” of the city. We were ready to explore. And because of that, we decided to walk. First stop was the Bell and Drum Tower. They were pretty close to the courtyard we were staying at and saw it from the night before. The climb up the Drum Tower was pretty steep that when we saw it was the same for the Bell Tower, we passed the latter -he had a bad sprain from playing football just days before our trip! Outside was this eatery where we were happy to find that all the food and drink we ordered costs less than 2GBP. 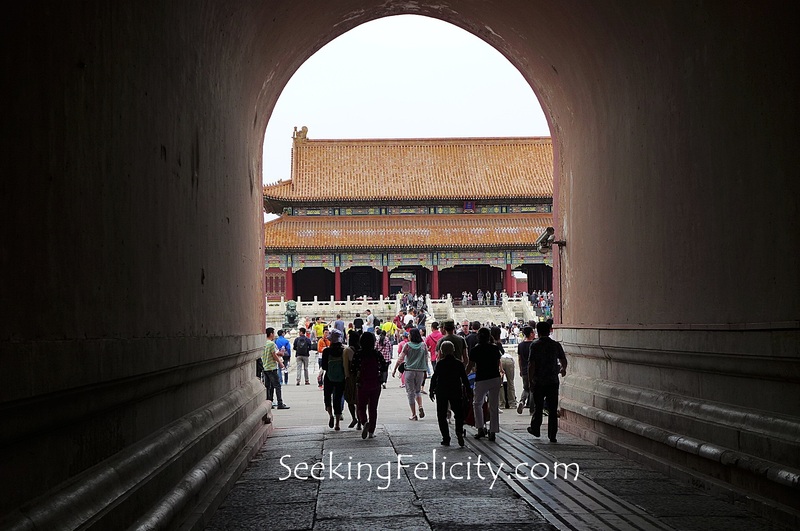 More walking led to Jingshan Park with a beautiful view of the Forbidden City – our next stop. 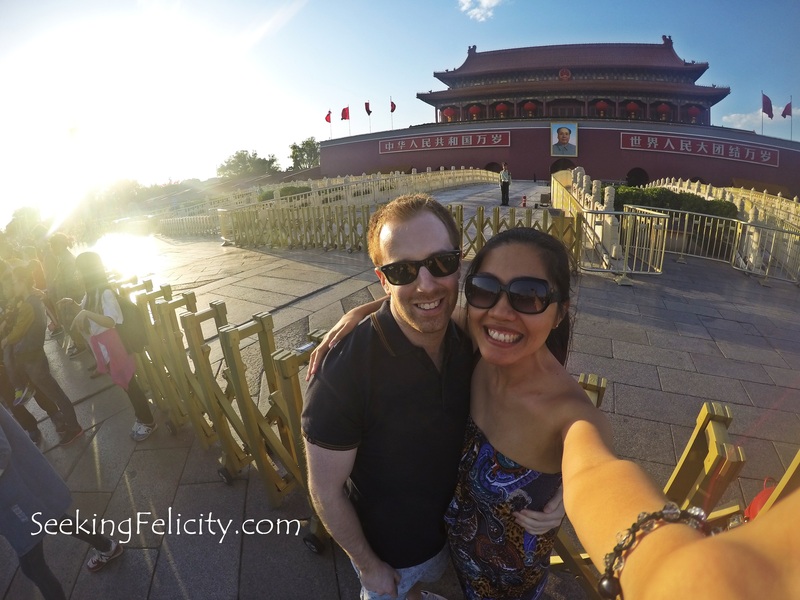 We walked the perimeter of the Forbidden City and ended up in Tian’amen Square. We took a cab back home. We had a business card with our courtyard’s name written in Mandarin on it (this really helps!). Since we’ve realised that eventhough sights look close together on our map they’re still (really) far apart, we got on a cab to take us to the Temple of Heaven. It seems that the place is a popular choice for pre-nuptial photo session. There were at least 5 couple when we got there. I was checking out the gowns of the ladies. The bf thought the whole thing was too over-the-top. Looks like we won’t have any of that then T_T. 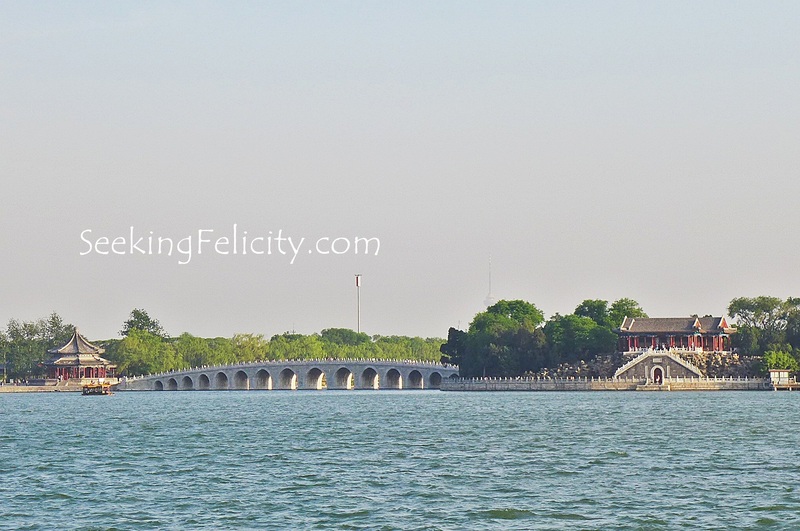 After more walking, and lunch break of course, onward to the Summer Palace it is! He didn’t want to backtrack when it was time for us to head home so we just kept on walking. He admitted that we might have gotten a bit lost after we found ourselves on a dead end under a bridge, beside a river or was it a stream, can never really tell with cars whizzing past overhead! 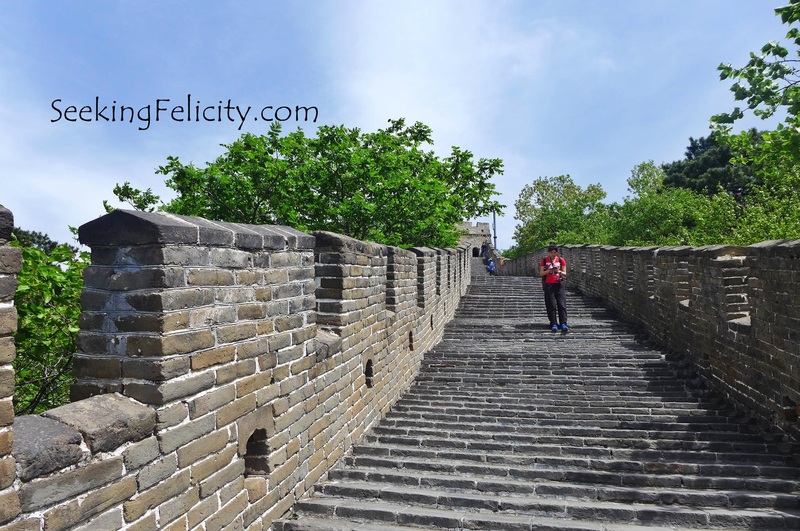 We opted to do a DIY trip and away from the crowd of Badaling. We started early, relatively speaking, so we can head to Mutianyu and comeback before sunset. The fact that there were so few other tourists there definitely added to its charm! 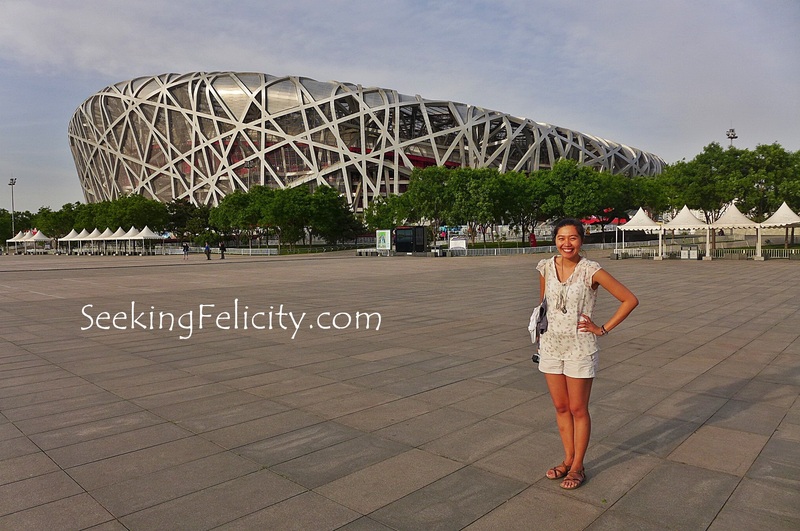 After a fun-filled daytrip to the Great Wall, next stop was the Olympic Stadium, more popularly known as the Bird’s Nest, that was the venue of 2008’s summer games. Then off to Wangfujing Street Market to sample more Chinese food (or in this case, snacks)! I’ve read about them in history books from when I was a little girl. Seeing our generation’s greatest architectural find was something I wouldn’t pass up! Even if that meant getting on a 4-hour bullet train ride from Beijing to Xi’an just to see them (and trying the sleeper train from Xi’an to Shanghai)! We only really had a full day in China’s biggest city. 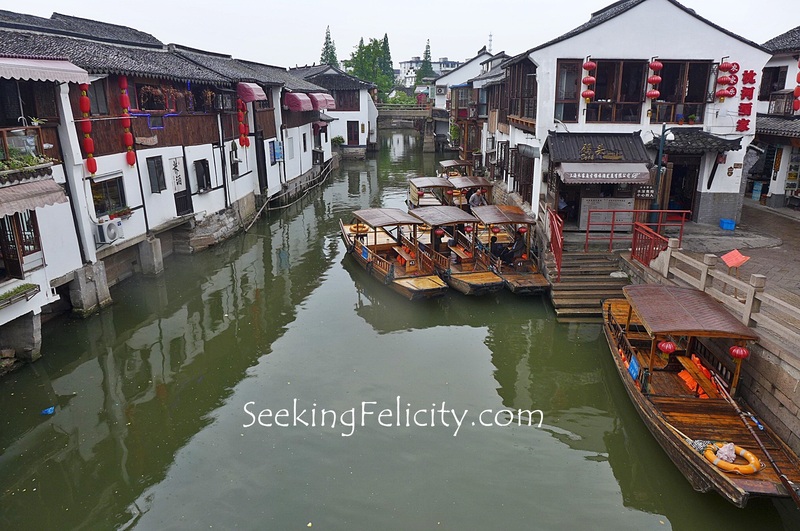 I should have visited its many beautiful sights but after seeing a picture of the country’s best preserved ancient water town (Zhujiajiao aka Pearl Stream) and I knew that it’s the place I would love to see most! Following online instructions, we still got a bit lost but everything worked out in the end after a young Chinese couple helped us find our way eventhough we couldn’t understand each other. :D My only regret was we couldn’t stay the night here – it’d have been amazing!